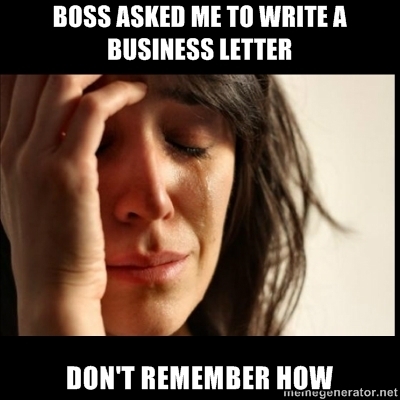 Ever tried to write good business letters? Many bright people, perhaps you're one of them, go to great lengths to avoid writing business letters. Even when it means losing the business or customers. The threat of facing a blank page or a bare computer screen can be more powerful than the need to write a letter. Just the thought of getting started can strike absolute utter terror! "How should I open the letter?" "Just what information do I need to include?" "Am I communicating in the best tone for the situation and is my approach the most effective one?" "What closing will bring the action or reaction I want?" Sometimes the challenge of all these factors so overwhelms us that no letter at all is ever sent, or the letter that is finally composed misses the mark completely. Frustrating isn’t it? Well it's not that difficult. Want to know how to make it easier? Read on and learn how. Most of us at work or business write e-mail or business correspondence but few of us can write an effective letter. In my previous life as a consultant with Deloitte Consulting, then a project manager for DHL, and now as a business owner, I found that the average letter is impersonal, overly-formal, longwinded and difficult or tedious to read. When you write a letter you create an image of you and your company in your reader's mind. A good letter should be effortless reading that makes you want to read more. It should be clear and concise, with short sentences and simple words. It should keep to the facts and be easy to read and to understand. I understand that most business related materials are boring (zzz…. ), so I have tried to put in a bit of humor in some of my examples. There’s a letter to Dr. Evil, Al Capone, Kermit (the frog) and more. Read on to find out how you too can write a good letter (and have a little fun too). This page covers 10 important and practical tips to keep in mind when writing your letter. This advice alone will help you write an effective letter. The way a letter looks immediately gives the reader their first impression even before they read it. That is why it is important to use the correct business letter format. Find out what a professional letter format looks like here. My Recommendations for the best Business Letter Books, Software and Templates. These additional tools will help you write a great letter fast. This cover letter advice comes from my years of experience as a manager with 13 people reporting to me as well as my experience as an employee looking for a job. When you are bidding for a project or sending a proposal, always send a cover letter along with it. Unless of cause, you don't intend to win the project. Find out the tips and tricks from a business owner that writes and reviews proposals. Find out the basics of successful sales letters, what works and how I personally use this one simple trick to increases conversions by 400%. There are two parts to writing a letter of introduction, Introducing a person or company and Introducing a product, equipment or service. The following explains how to write both types of introduction letters. This is my ebook. I have a very special offer for the readers of writing-business-letters.com. See what I have in store for you and I'm sure you'll love it. Would you like to share your knowledge about business letters? Would you like to share your knowledge about business letters? Contribute to www.writing-business-letters.com!